What's New in Version 4.2 ! Take ownership of files and folders which are restricted to the users or damaged file attributes for the ownership with optimized settings. Taking ownership of files or folders are easily accessible from the windows context menu of file or more easily possible to drag the file or folder to the program and requires administrator privileges to run the program. The application checks the system for registry modifications, and updates as it required. Allows end user to select turning on general files or folders, executable or library files to take ownership from the context menu. 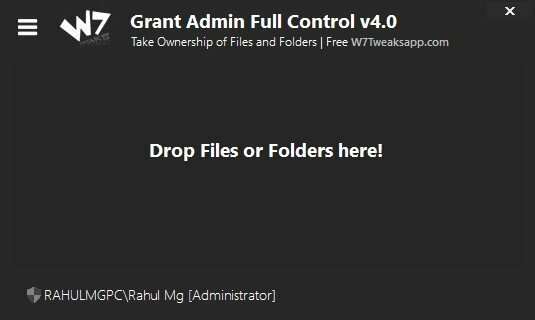 An experimental feature included in the program, which is taking ownership of files and folders within the application, grant admin full control. Which takes ownership with inheritance from the top level users like System, Administrators Group and more. It strongly required that the end user must have minimum read access to the required file or directory. It helps to change the current owner of the file or folder to the current user with administrator privileges. Softpedia guarantees that Grant Admin Full Control is 100% Clean.